The Bounty Hunter single action revolver has been sold in the USA for over 20 years. 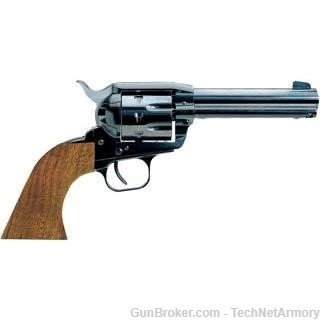 Made in Germany and available in .357 Mag, it is simply one of the best single action revolvers produced. You can purchase a more expensive, or a famous brand, but you won’t be getting a better single action firearm. The Bounty Hunter is a traditional 6 shot single action revolver with traditional resting notch, but it also has a transfer bar and recessed chambers for shooting safety. There are a lot of single action revolvers out there but none better than The Bounty Hunter from EAA Corp.
Ruger Redhawk .44MAG 5.5" Stainless 5004 Smith + Wesson Model 686 .357MAG 4" Stainless 164222 S+W 686 Plus .357Mag 2.5" 7 Rounds Stainless Steel 170346 S+W 686 Plus 164198 .357M .38S&W 6"